Geneva. 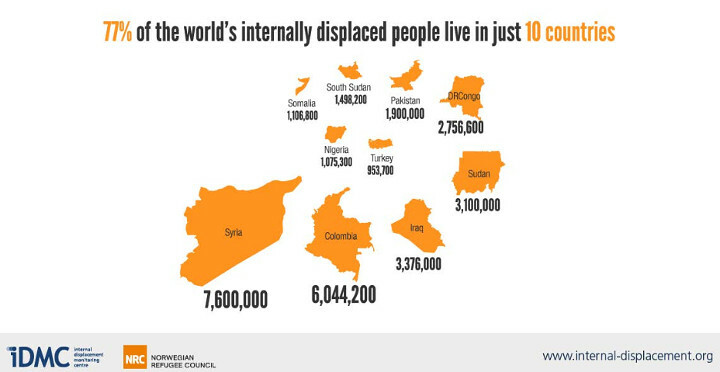 - A record - breaking 38 million people have been displaced within their own country by conflict or violence. This is the equivalent of the total populations of London, New York and Beijing combined. "These are the worst figures for forced displacement in a generation, signalling our complete failure to protect innocent civilians" said Jan Egeland, secretary general at the Norwegian Refugee Council (NRC) on Wednesday during the launch of the report "Global Overview 2015: People internally displaced by conflict and violence" at the United Nations in Geneva. With internal displacement figures reaching a record high for the third year in a row, the report also documents that 11 million people were newly displaced by violent events throughout 2014. "Global diplomats, UN resolutions, peace talks and ceasefire agreements have lost the battle against ruthless armed men who are driven by political or religious interests rather than human imperatives," said Egeland. "This report should be a tremendous wake-up call. We must break this trend where millions of men, women and children are becoming trapped in conflict zones around the world." Volker Türk, UNHCR’s Assistant High Commissioner for Protection, said that the staggering number of internally displaced people because of conflict and violence is a harbinger of movements to come. "We know that more and more internally displaced have been forced to move within their country multiple times. The longer a conflict lasts, the more insecure they feel and when hopelessness sets in, many will cross borders and become refugees," he said. "And as we have seen in the recent past, for example in the Mediterranean, despair drives people to take their chances and even risk dangerous boat journeys. The obvious solution lies in an all-out effort to bring about peace in war-ravaged countries," Mr Türk added. The report also highlights how long-lasting, or protracted displacement, contributes to this alarmingly high global total. In 2014, there were people living in displacement for ten years or more in nearly 90% of the 60 countries and territories IDMC monitored. "As new or renewed crises emerge in countries such as Ukraine or Iraq, new caseloads of internally displaced people join an already massive global displaced population who seem blocked from finding ways of ending their displacement" said Alfredo Zamudio, director of IDMC. "Much of this vast population includes those who were displaced many years ago, like in Azerbaijan or Cyprus, so what we commonly see is that the very act of displacement forces an individual into a vicious cycle that becomes harder to escape from the longer they are in it" said Zamudio. The IDMC report describes how displacement often reveals underlying structural challenges within a country, and how it can be prolonged by a government’s deliberate politicisation of the issue or its refusal to enter into a formal resolution of a crisis. "38 million human beings are suffering - often in horrendous conditions where they have no hope and no future -and unless we challenge ourselves to change our approach, the shockwaves of these conflicts will continue to haunt us for decades to come," said Egeland.